Art, for the Yolngu, has long been a system of communication through which they have articulated their political structures, their spiritual inheritance and their unshakeable sense of being owners of the lands into which they are born. Through the forms and symbols of their paintings, and through the social practices by which the meanings of those paintings are told, withheld and exchanged in rituals of birth, death and initiation, Yolngu enact the enduring coherence of their society. Art is no mere past time for Yolngu, and it is more than beautiful decoration for its own sake. Yolngu art is one of the essential practices by which they reproduce themselves as a civilisation. It is integral to their politics, their education and their religion. The Methodist missionaries who lived among Yolngu at Yirrkala from 1934 saw value in Yolngu art and so encouraged, for their own reasons, its continuing production. 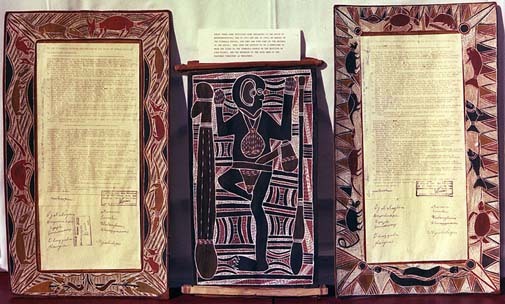 As brokers of paintings on bark to the outside world, the missionaries hoped to allow Yolngu a wholesome contact with the wider Australian economy and to encourage other Australians to respect Yolngu as human beings, rather than dismiss them as mere savages. Morphy, Howard 1991, 'Ancestral connections: art and an Aboriginal system of knowledge', University of Chicago Press, pp 17,19. Still: Bark petition. Courtesy of AIATSIS.